"I understand the anger. I understand the confusion." 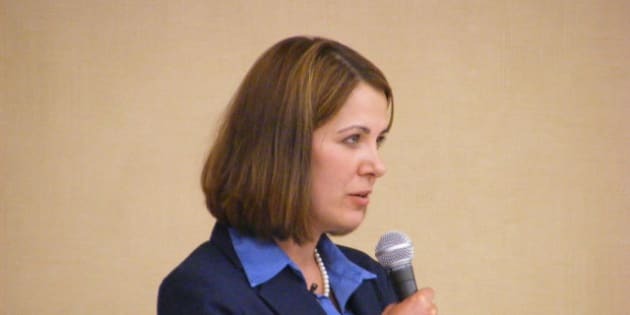 EDMONTON - Former Wildrose leader Danielle Smith says life inside the government tent has been more rewarding than "setting your hair on fire" in opposition. "The levers that you have in opposition are a little more limited, " Smith, now a Progressive Conservative backbencher, told a lunchtime crowd Wednesday at the Okotoks Chamber of Commerce in her Highwood riding. "You can light your hair on fire and do a press release. You can light your hair on fire and do a press conference. You can light your hair on fire and ask a question in question period. "In government, it's a little bit different. You can write a briefing note and have a meeting with the premier or the minister to talk through the different issues." Smith said as the opposition leader she had to loudly push the government to fix problems whereas now she can quietly pull issues along behind the scenes. "Before I was in push mode," she said. "Now I'm in pull mode." Smith and eight of her Wildrose colleagues endured widespread criticism and anger after they crossed the floor to Premier Jim Prentice and his Tories in December. The move gutted the Official Opposition, leaving it as a shell of itself with five MLAs and no permanent leader heading into an expected general election this spring. Smith told the crowd that it wasn't her idea to cross over to Prentice, but that the idea was pitched to her in December by her two lieutenants, MLAs Rob Anderson and Shayne Saskiw. "I said, 'Go ahead, let's see what the conversation leads to,'" said Smith. Saskiw, who did not cross the floor, has previously said crossing the floor was Smith's idea and that he was picked to help because he knows Prentice's chief of staff, Mike Percy. He said he met a number of times with Percy but didn't have the heart to continue the talks and dropped out. After her speech, Smith took questions similar to ones she used to field as Wildrose leader, including one on the Federal Building. The building, opening this month for MLAs and staff, went years over schedule and more than $100 million over budget. As Wildrose leader, Smith once labelled it "The Taj Mahal of Provincial Waste," indicative of the Tories' "legacy of waste and mismanagement." On Wednesday, she said, "I don't believe that (building) was the right priority." "This is why the new premier is taking such a different approach to infrastructure in wanting to make sure that we have a public prioritized project list on the basis of need." She was asked if residents should feel "betrayed" by her floor cross. "I understand the anger. I understand the confusion," she replied. "(But) when you change the premier, you do change the executive, you do change the direction of government. "The direction that (Prentice) wants to go and the direction that I've been advocating to go are virtually identical on so many fronts." With few questions being asked, Smith at one point suggested the crowd might be media shy. "Do you want to ask the media to leave to see if we can get more questions?" she asked an organizer. That was rejected when Smith was told she was out of time anyway.